The simple reason that gold is an "unabashedly strong buy"
Plus, why is one investing giant shifting to “maximum overweight” on gold? This week, Your News to Know delivers the hottest news stories involving gold and the overall economy. Stories include: Three conditions that could push gold past $1,400, a $230 billion man goes maximum gold, and the U.K. Royal Mint is making big money from the recent gold rush. How much higher can gold go from its highs of the past month? According to several strategists, $1,400 per ounce is a realistic goal that might be reached sooner rather than later. According to a recent report on CNBC, there are three conditions in the current market picture that could send gold past $1,400. The first is the Federal Reserve’s dovish stance: Boris Schlossberg, managing director at BK Asset Management, believes that gold is bound to go up as long as the Fed staves off further rate hikes. “Until and unless central banks begin to tighten policy, gold continues to be an unabashedly strong buy,” Schlossberg told CNBC. He pointed out that gold rallied after the Fed gave no indication of doing anything in September and added that this has been a recurring theme throughout this year and the previous. 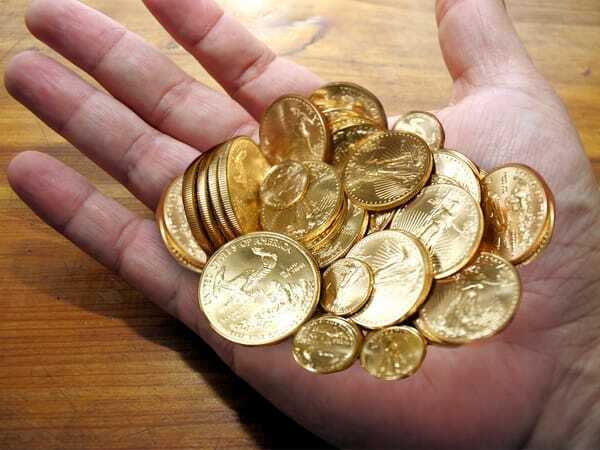 “I think we have a very reasonable chance here to make $1,400 on gold before the end of the year, assuming the Fed stays stationary,” Schlossberg predicted. As for predictions, Krinsky is a little more optimistic: He not only believes that $1,400 is likely but finds $1,500 to be a realistic high. “If you close above $1,400, there’s a pretty good [chance we can get] what we call this quick ‘air pocket’ that could get up to $1,500,” he said. As chief investment officer at Canada’s TD Asset Management, Bruce Cooper oversees as much as $230 billion of investor money. Among all other assets, Cooper sees gold as the most valuable to hold with the current state of the global economy. TD’s actions fully reflect Cooper’s stance: The firm shifted to “maximum overweight” in gold for the second quarter from the previous “modest overweight” designation. “We turned more positive on gold at the beginning of the year and then we reinforced that in the second quarter,” he said. Cooper also added that Germany and the U.S. are two countries that TD money managers are watching “like a hawk”: A move away from traditional austerity by the former, or a fiscal stimulus driven by the Democrats in the latter could shift the global economy into a more inflationary state. Gold has enjoyed considerable success in 2016 due to global market volatility: The metal is up by about 25% and stands to go even further. Among the chief beneficiaries of gold’s recent rally is the U.K.’s Royal Mint; last week, the government-owned minting company reported its highest revenue in 1,100 years, amounting to a 64% increase in revenues from gold and silver trading. The company already saw a seven-fold increase in sales after the June 23 referendum on the Brexit and says demand hasn’t eased up since. In fact, record low and negative interest rates are a major driving force behind gold’s current rally and increased demand for the metal around the globe. The Royal Mint’s chief executive, Adam Lawrence, also credits silver for the company’s sales performance: “The growth in our bullion business has been built across many activities but our increased competitiveness in the U.S. silver market has been at the center of our growth,” he said. In the United States, both gold and silver coins made by the British mint are now accepted as investments in Individual Retirement Accounts (IRAs) and Health Saving Accounts. How Morgan Stanley Is Playing Roulette With Your Money. Read more here.